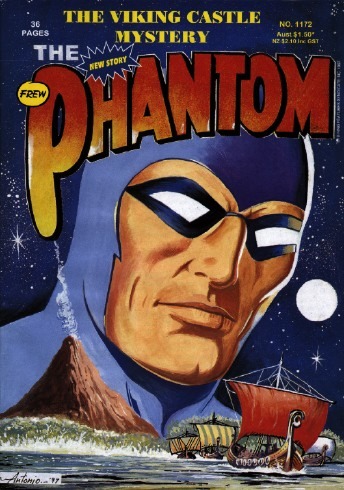 Frew published 31 editions of The Phantom comic in 1997, with a total count of 1868 pages. The net cover price for all of the 1997 issues was Aus$78, and if you do your arithmetic, that works out to an average of 4.2 cents per page. 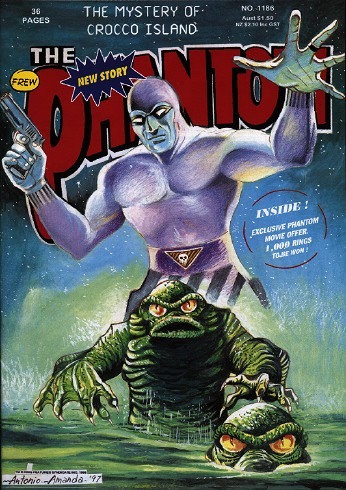 The now-traditional Annual issue in January (#1156) ran for a monstrous 332 pages, plus an extra 32 pages for the bonus replica edition of Frew's #6 The Phantom comic from 1949. With a total page count of 364, the 1997 Annual is the largest Frew issue ever produced ... and it STILL sold for only Aus$10! The title of the largest individual Frew comic still belongs to the 1993 Annual (#1032). A detailed breakdown of the size, price and number of issues published in 1997 is shown below, in comparison with the last two years. A quite incredible statistic is that the cover price of a basic 36 page issue has now remained at $1.50 for more than 10 years! There were a total of 54 stories this year (including the replica edition), and 24 of these were reconstructed Lee Falk classics (see table below). Stories from the 40 year period between 1943 and 1983 were evenly represented, providing fans with a wonderful profile of the development of Lee's writing, and a good sampling of the range of artistic styles used on the strips by Wilson McCoy and Sy Barry. Frew also presented us with Lee's three latest stories, which renewed our acquaintance with Rex King, revisited the dinosaur theme with another find of real-life survivors, and reminded us of the slave-trade still persisting in some parts of the world. Combining these with the edited version of The Singh Brotherhood in the #6 replica edition, brings the total number of Lee Falk stories in 1997 to 28 -- that's 52% of the total number of stories published. This year there were 25 new stories from Semic. Some of these were part of longer continuities: The Golden Fleece (4 parts), The Royal Murder Plot (2 parts), and Death of Lubanga (2 parts). The latter story was very well received as it finally spelt the end of a controversial plot that began in 1994, and caused a lot of confusion to new readers. Claes Reimerthi was the most prolific of the Semic writers with 11 of his stories being printed. Other stories were written by the late Donne Avenell (4), Tony de Paul (4), Lennart Moberg (2), Sverre Årnes, Scott Goodall, Norman Worker and the Ikonen/Hansgård team (1 each). It was especially good to see Scott Goodall returning to The Phantom after a two year hiatus, with his wonderful story The Jungle Saying -- easily the best Semic story of the year IMHO. The artistic credits for the Semic stories were broken down as follows: Romano Felmang and his team (5), Carlos Cruz (4), César Spadari (4), Joan Boix (4), Hans Lindahl (3), Heiner Bade (3), and Kari Leppánen (2). The last of the 54 stories to be mentioned actually appeared in the first issue of the year (#1156) -- a reprint of the second Australian-created Phantom story, Revenge of the Singh Brotherhood , created by Jim Shepherd and Keith Chatto. First published in 1990 (#962), it was great to see this well-constructed story once again. This was a special treat for "those who came in late". And finally ... the covers. This year we were treated to two very special handpainted covers by Antonio Lemos (#1172 and #1186 shown above), which were simply stunning pieces. I sincerely believe that these were even better than the high quality covers produced by Semic for their Scandinavian versions of these stories. The art credits for the covers were as follows: "Tessa" (11), Antonio Lemos (9), Jim Shepherd (8), and Glenn Ford (3). It was nice to see Glenn Ford's return to cover art duty after a long absence due to the pressures of working on the Search for Byron story published last year. So as 1997 draws to a close, we can look forward to celebrating Frew's 50th anniversary in 1998. September 9 marks the historic birthday and will be commemorated with a special bonus issue and a black tie dinner function in Sydney. History of Frew Publications Pty. Ltd.